In Purnulula (Bungles). Did helicopter ride and two magnificent walks. Also, driving in and out the scenery was spectacular. The facilities were primitive but that added to the attraction. Garry. He spent a lot of time drawing on the bus and the one of Blues hand on the steering wheel was very good. Rabbit Flat. The sky was lit up with stars. Robyn. Attends ballet regularly and had an expert knowledge of opera and classical music. Best Campfire Wood Collector (and Driver). Blue. He had a clever open weave mat to hold the wood which was tied to the front of the trailer. Click here to see picture. Along the way he would stop from time to time and we would collect wood. There were lots of lovely places but Galvans Gorge stands out. With a Boab tree at the top of a waterfall and water cascading into a pool at the bottom it was a beautiful scene. 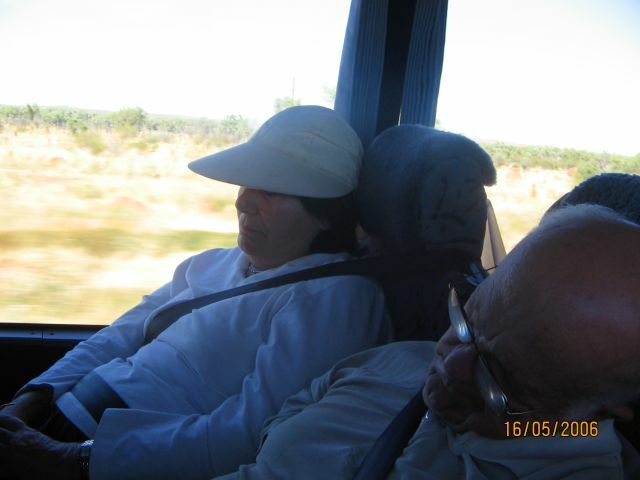 Robyn was ill at Kununurra and Joan at Broome. John D sliced his finger on a camp stretcher. Blue. Click here to see picture. Ged and Sheila. Whenever the bus stopped the binoculars were up. I had never noticed birds that much before and I was surprised at the number and variety of bird life around. The “zip-zip” bird. We all heard the noises during the night and early evening and it happened at every camping location. I asked Ged and Sheila if they had a photograph of this bird but it was not in their bird book. Marilyn. I caught her a few times looking very cold and was bemused to see that she still had her shorts and sleeveless top on. On the morning we were to depart Katherine the bus had a flat battery. We had to push the bus and jumpstart it! Luckily, it was flat ground with concrete driveway so it started easily. 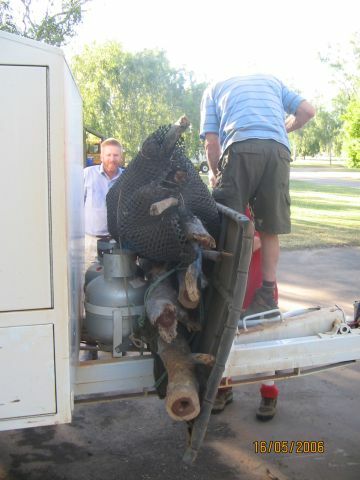 New Batteries were fitted at Kununurra. On the morning we were to depart Kununurra, Blue was negotiating the bus around trees in the campground. Whilst backing the bus the trailer jack-knifed and snapped the air hose connections to the trailer. This was fixed within an hour by a local mobile mechanic. About half way along the Gibb River Road the trailer had a flat tyre. By the time we stopped it was shredded with virtually nothing left. Luckily, the rim was OK. However, we could not find a socket to fit the trailer wheel nuts. The trailer rim, tyre size and hole spacing had been specifically arranged to be the same as the bus so the spares were interchangeable but nobody thought to make the nuts the same size. Frantic calls on the Satellite phone discovered that another Outback Spirit bus was about 10 minutes behind us. Luckily, they had the correct socket. 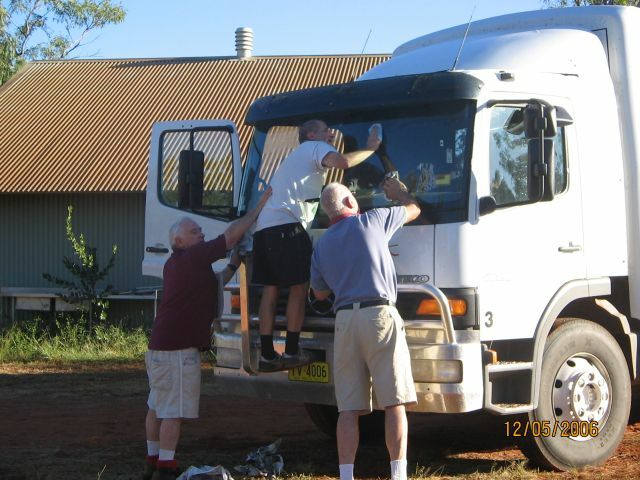 A new tyre was fitted at Halls Creek. The brakes on one side of the trailer were overheating. This may have contributed to the previous problem by overheating the tyre. Blue adjusted the brakes. 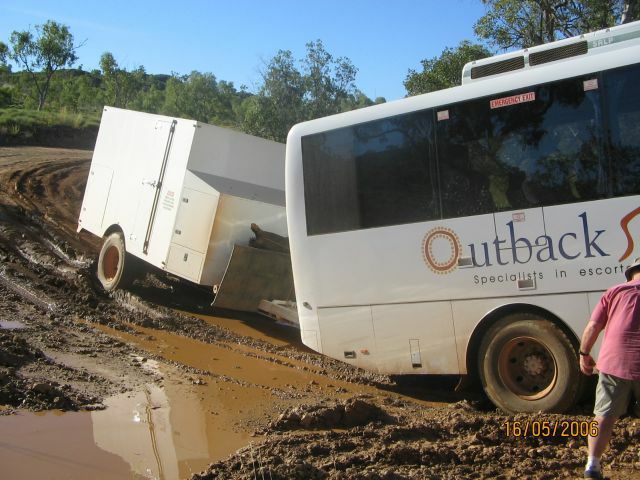 Whilst driving into Purnululu (Bungles) the bus got bogged negotiating a tricky creek crossing. Click here to see picture. We all pitched in and using buckets and shovels threw dry shale under the back wheels. We were out within an hour. Along the Tanami Track, a mounting bolt on the secondary alternator broke. It could not be fixed so the alternator was taken off. It supplied charge to the batteries for the auxiliary items such as hot water so it could be done without considering were were near the end of the trip. Sometimes it was difficult to hook the trailer on and off. Rabbit Flat. 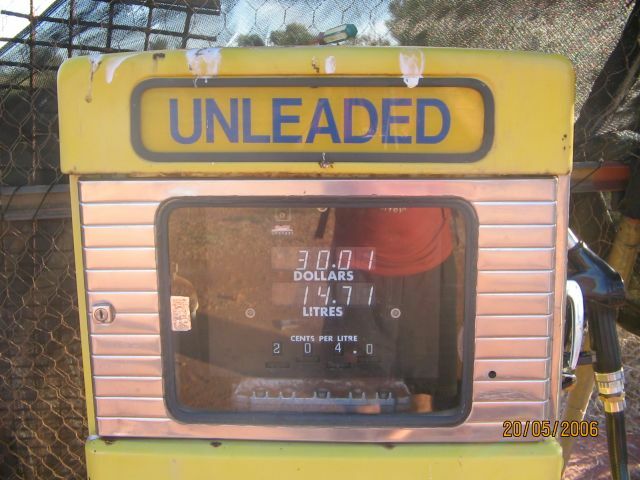 Unleaded $2.04/Lt. Click here to see picture. Kununurra. High potential for improvement. Plenty of water and electricity. Reasonable climate. Lots of farming. Close to spectacular scenery. Close to ports. Forgot to ask Blue at the end but I estimate 4,500Km. Me at Mt Barnett. Click here to see picture. Peter A and Nev helped. Dennise and John. Whilst everyone helped I did notice that they always pitched in. In particular, when the bus got bogged coming into Purnululu (Bungles), Dennise was filling buckets with Ann and John was filling buckets with me. Emma Gorge. The cabins were of a strange construction and because they were placed in a gorge with nice scenery they were very unique. I understand that they dismantle the cabins during the wet season and store them somewhere. Betty and Maureen. Betty filled up her 1G Byte camera card a few times and had the contents transferred to CD at every opportunity. Maureen used over 30 rolls of film. Doug. 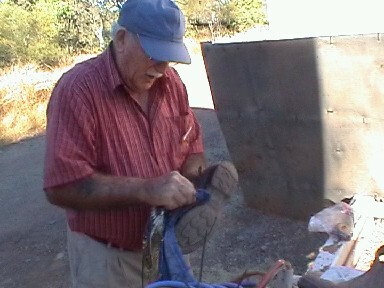 In Purnululu (Bungles) he cleaned Blue's boots. Click here to see picture. Why did he bring his boot polishing equipment with him? Pull down blinds instead of pull across curtains. On a later trip, the bus we were on had pull down blinds. The blind could clip into one of 3 positions. A better way of attracting attention of the cabin crew. 240v power outlets on the bus to charge phones, lights etc whilst travelling. This would be easy and cheap to do with an inverter. Doug. He played a few tunes around the campfire at Windjara Gorge. Peter S at Emma Gorge. He made sure that nothing went to waste. Click here to see picture. I counted 4 ex teachers. David. Any time we stopped and there was a chance of swimming David was the first there. I also noticed John and Marilyn sunning themselves around various pools so I suspect they also did some swimming. Maureen. She had this blue folder bulging with information about everything we would pass through or be nearby. I even used it a few times. 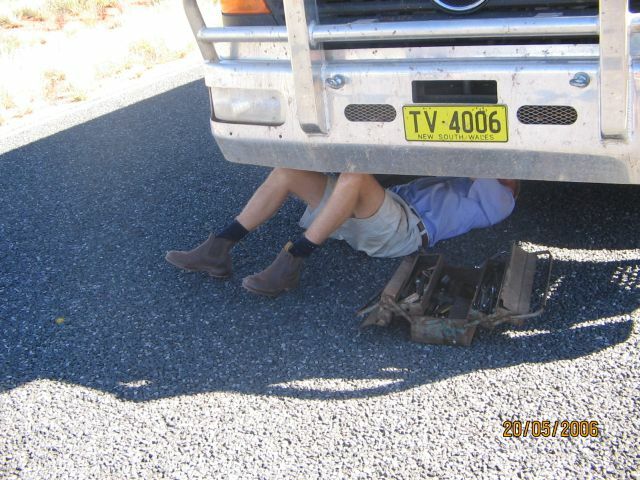 When we had a trailer flat tyre on the Gibb River Road and there was not a socket to fit the wheel nuts. See Bus Problems. John D and Dennise. 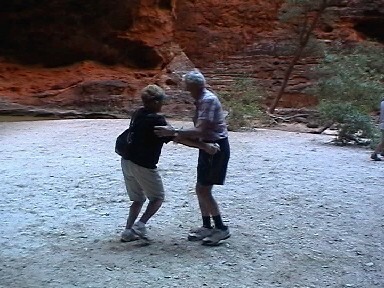 In Purnululu (Bungles) in the Amphitheatre at the end of Cathedral Gorge. Click here to see picture. Peter A. He put on a kite flying exhibition for us at Old Halls Creek and videoed the entire trip with precision. Broome. Pearl Luggers was good, nice beach and some fishing. Apart from that it was too glossy for me and there is really not much else to see locally. John H. He always appeared when the meat was being cooked and did a good job of it. Arriving at Rabbit Flat (it is hard to admit). On this day we had driven 400Km on dirt track, some of it in very poor condition. We had lost 1.5 hrs due to time zone change across the WA/NT border. At 5.00 we were still 123Km from Rabbit Flat. Click here to see picture. It took another 2.5 Hrs to get there and we were counting down every 10Km “RF” sign and looking for the lights in the distance. It was good to finally get there even though we erected our tents in the dark and did not have tea until about 10.00. Clyde. After becoming a paraplegic following an accident and learning to walk again he amazed me with the places he walked to. He told me the hardest thing was climbing the steps into the bus. Ann also did well considering her ankle had only been out of plaster 4 weeks. Stairway to Heaven at Broome. I had never heard of this event and it was not on the itinerary. Various people convinced the Tour Guide to take us there and it was well worth it. Barbara. Her hat with the wire net in a small bag fastened to the hat fascinated me. The motel at Katherine had the best food but Emma Gorge had the best environment. 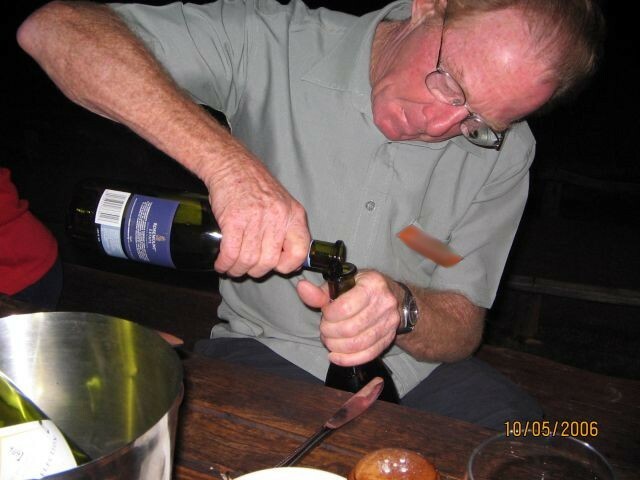 The open air dining area at Emma Gorge was lovely and because the food was not the quality it should be, Outback Spirit provided the wine. David. He lit it many times and was usually one of the first around it in the morning to stoke it up again. Isobel. In Purnululu (Bungles) in the Amphitheatre at the end of Cathedral Gorge. It is interesting to find out peoples opinion about some controversial issue so I asked nearly everyone (apart from 3 or 4) whether they supported the war in Iraq. Of those I asked, only one fully supported it. Joan. She was creating a patchwork quilt made up of 28 hexagonal pieces of different colours. Each piece had the signature of one of the bus occupants. The signatures were to be embroidered and the pieces to be sewn together. I don't believe she did much sewing along the Tanami Track. Maureen and Garry were married on the same day and year as Ann and I on the 10th May 1969 and also had 4 children (1 girl and 3 boys). The tour group purchased cards for us and made us give speeches (at Emma Gorge dinner) on our anniversary. Thanks very much to everyone for that. 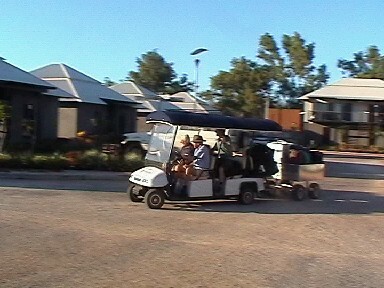 After the 19 day tour finished, we saw them a few times later and even at the Alice Springs airport when leaving. I believe our paths will cross again. 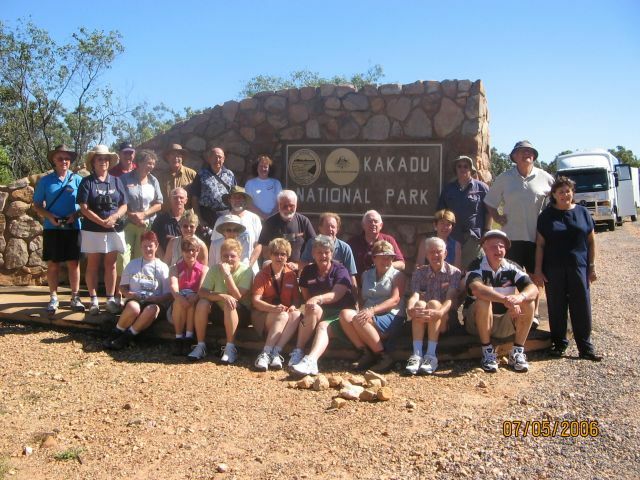 Barbara and Peter also celebrated their anniversary a few days earlier in Kununurra. The one at Rabbit Flat was the only camping toilet with sign. Click here to see picture. The one in Purnululu (Bungles) also served as a shower. We hooked a hose to the tap beside the toilet and hung it over the toilet wall. The water was warm and it also cleaned the toilet. 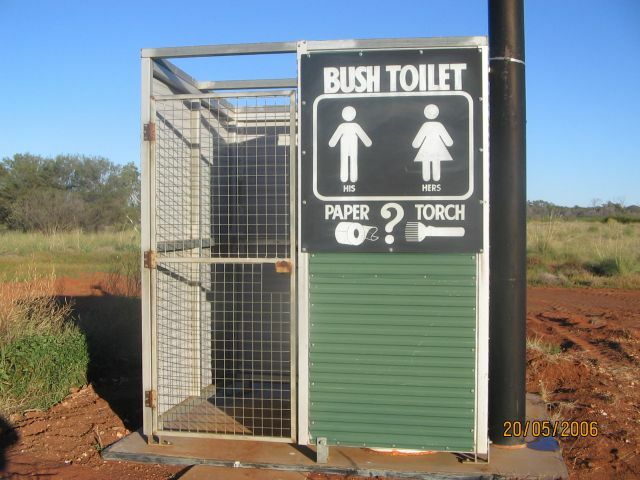 The public toilet at Halls Creek was a fully automated one. Having such a sophisticated toilet in a remote town was a surprise. The one in the bus I never used but it was handy to know it was there. It did smell on occasions. The toilets at Windjana Gorge had locks on both sides of the door. Joan got locked in by someone and had to call for help. Very embarrassing. Tom and Isobel. They amused me with their camping antics. I discovered early in the trip that they had never camped before and had misread the brochure. Tom told me he had learnt skills that he will quickly forget so I guess they will not be camping again. A colouring book of the Kimberleys at Broome. Jubes in the shapes Australian animals at Emma Gorge. Best Snake Spotter and Catcher. Blue. He spotted a Black Headed Python on the Gibb River Road near Windjana Gorge. At the Purnulula (Bungles) campsite a snake was spotted under the bus one night. Blue moved it. Purnulula (Bungles). Far, far exceeded what I expected and the helicopter flight made it even better. Ann. Every other lady had “travelling” hairstyles. 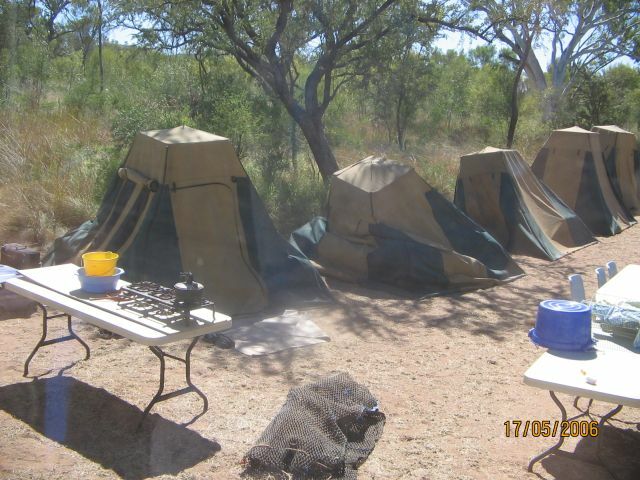 At Purnululu (Bungles) when we came back from our walks some of the tents looked very sad. Click here to see picture. Audrey and Doug. With 6 children and ? grandchildren they had lots of interesting and amusing tales. At Pearl Luggers in Broome. The hour long talk about the pearling industry in Broome was excellent. Joan. One day when she was ironing her husband Nev happened to bend down with his rear end towards her. In a villainous moment she picked up the iron and pointed it towards his behind. What she didn’t expect was the spurt of steam that came out of the iron directly into Nev’s behind. She said he got the biggest fright of his life. Joan told us this story with a completely straight face and had us in fits of laughter. I was surprised at the amount and variety of travelling people had done. People didn’t mention it much unless I asked them and I learnt a lot of useful travel information. It appeared that Betty, Ged and Sheila were the most travelled. Windjana Gorge off the Gibb River Road. That evening, the moon was so bright that we ate our tea under the moonlight. Doug played his harmonica around the campfire. The area was nicely grassed, 3 toilets and a “cold” only shower which had warm water. We had steak for tea that night. Click here to see a description of what the meat was NOT like..
Kate. When camping, she was always late getting her coffee and handing her plate in for washing. Mt Barnett Roadhouse on the Gibb River Road. 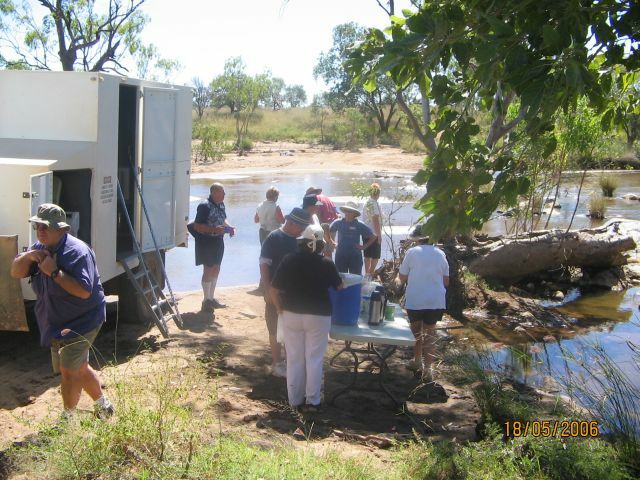 After we could not get into Manning Gorge because of flooding we camped beside the roadhouse. Strange place. $8.00 to use a charger of any type. I counted 6 “Do not ….” Signs. For example “Do not drink this water”, “Do not park in driveway”. There was only one male and one female toilet and shower and we had to fight with other campers to use them. In the morning the camping area was damp and muddy. David. He sorted out a few etiquette issues on the bus. Blue, John H and Peter S at the Broome Cable Beach resort. Click here to see picture. Brooms and dustpans for cleaning the tents. These were provided later. Clearly number every tent and sleeping bag so people could get the same one each time. The tents poles were a problem. The fixing nut snapped on some. The fixing nuts were difficult to do up and sometimes the poles slid down. An easy fix for the problem is for each pole to be made up of 3 or 4 fixed sections that slide into each other and the combined length of the pole to match the tent height. The poles can then be kept in the tent bag. “This is better than the Kokoda Track”. The padded area between the passengers and the cabin looked like a Punch and Judy stage. I was waiting for the marionettes to appear. The picture above the rubbish sign near the door was of a man. I told Ann she was not allowed to put rubbish in the slot because only men were allowed. Peter S. Always happy and joking with everyone. Fletchers Creek. On the way out of Purnululu (Bungles). Click here to see picture. Tom and Isobel. Click here to see picture. Lorraine and David. Although they were both travelling alone they happened to sit together on the bus and concocted their engagement. Apparently David found a rock that was gemstone like (engagement ring) and this was the start of the gag. It persisted for many days and was a source of much amusement on the bus. The Gibb River Road was in much better condition than I expected. This was partly because the road had only been open for a week. Quite a few sealed sections if each only for a few hundred meters. The Tanami Track was worse than I expected. In some sections we crawled through the bulldust and the corrugations at very low speed. During one of these low speed crawls a 4WD full of Aborigines passed us at high speed. I noticed that the vehicle had no windscreen or windows. Most Surprising thing anyone did. Isobel. 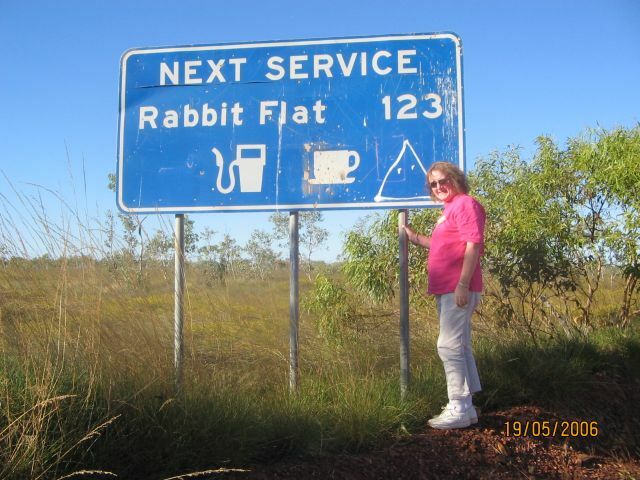 At Halls Creek, she walked around and found the Alcohol Rehabilitation Center and had a long talk with the people running it. El. She did a very good job under difficult circumstances. Having the mother of the owners of Outback Spirit as our tour guide had its advantages when we had bus problems. The food we had whilst camping was of excellent quality. 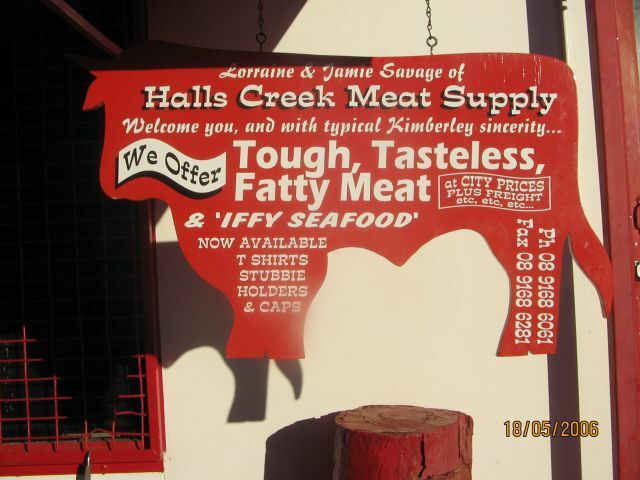 Halls Creek. The only motel I have ever been in that had a high fence around it with barbed wire at the top. I noted that it was a 4.5 star rated. One star must have been for the fence. Nev. The poem he recited at the final dinner was a gem. Click here to see poem. Breakfasts at accommodated stops should all be buffets. Hands free mike for driver. More information earlier whilst driving. Everyone we spoke to before leaving recommended taking extra strong strength insect repellent which we did. We rarely used it. We must have been lucky because others who had travelled there had bad experiences with insects. This is the only Australian bus trip I know of that has a mixture of camping and hotel/motel accommodation. It proved to be quite unique and enjoyable. We stayed in a hotel/motel about every third night. The only criticism is some of the hotels we stayed in were more luxurious than required. Considering we were out all day and most evenings, we only needed showers and a bed. Also, the hotels we stayed at in Broome and Alice Springs were both a few kilometres out of the main township. The hotels did provide shuttle buses to and from town but because our time was limited they were not always convenient.